OL26 North York Moors - Western area. 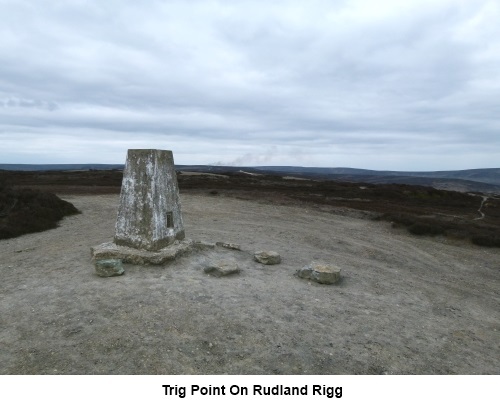 Introduction: Rudland Rigg is a long, north-south, flat hill above Farndale, along which ran an old drovers’ route between Kirkbymoorside and what is now Teesside. 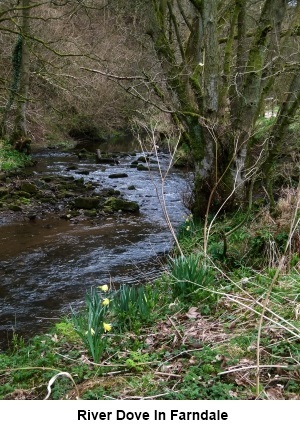 Farndale is a pretty valley renowned for its wild daffodils. 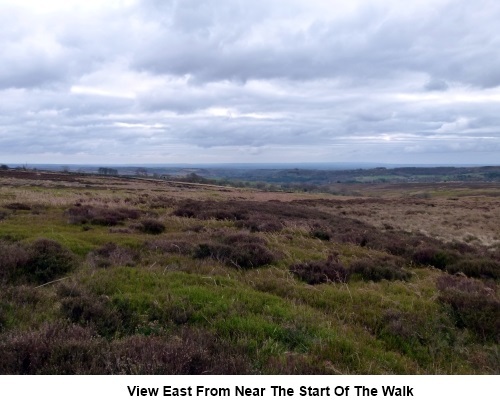 This walk incorporates both into a circular route. In itself, Rudland Rigg is a fairly featureless, heather clad hill and the route runs along a broad track, known as Westside Road. 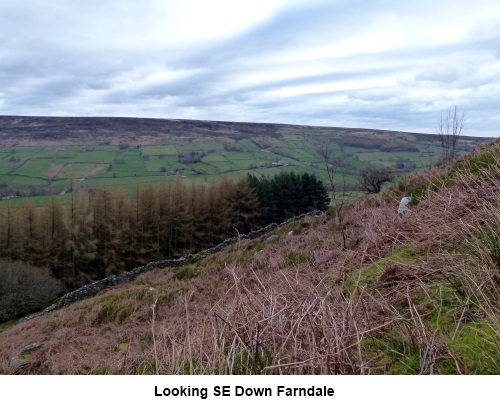 Where it scores is with fabulous views over Farndale to the east and west to Bilsdale. Its moment of drama came in 1944 when a Halifax bomber on a cross-country night flight crashed. The rear of the plane broke off, so saving the tail gunner’s life but the remaining crew were killed. Rudland Rigg will be a spectacular sight in late summer when the heather is in bloom. 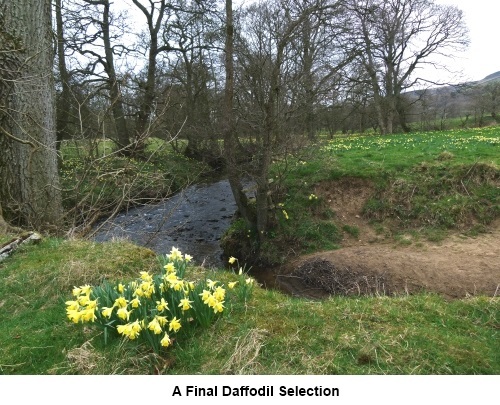 Farndale is pretty enough in itself, with the River Dove running through but it bursts into an extra dimension in early spring with its display of native daffodils. These are smaller and paler than the ones you get for the garden and are also known as Lenteen Lilies or Lent Lilies, as the blooms normally die off between Ash Wednesday and Easter. 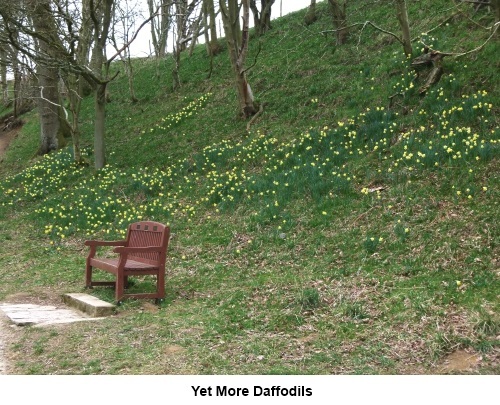 They are believed to have been planted by the monks from Rievaulx Abbey. If true, as this was sacked by Henry VII in 1538, the flowers have been there a long time! Pretty as they are, the downside is that visitors come from far and wide to see them, to the extent that a huge number of cars and coaches congregate in a huge car park, at the hamlet of Low Mill. An advantage of my route is that you avoid this tourist traffic on the narrow roads of Low Mill. Weekends are best avoided at this time of year, unless you like crowds! Outside the daffodil season, it is quiet. 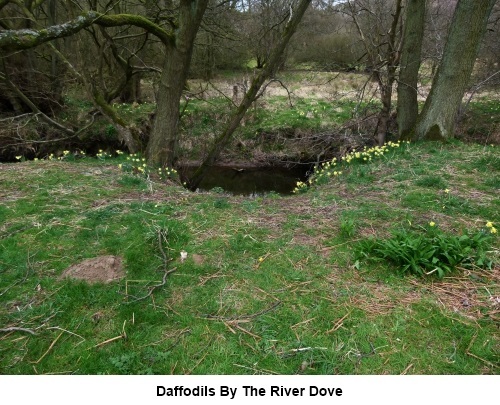 Farndale was designated a nature reserve in 1953 and picking/damaging the daffodils is prohibited. There are public toilet facilities and a café (Daffy Café!) at Low Mill and the Feversham Arms pub in Church Houses with a quarter mile detour. It is advisable to check availability if you are relying on these. My route starts from a rather anonymous rough lay-by on a quiet country lane. 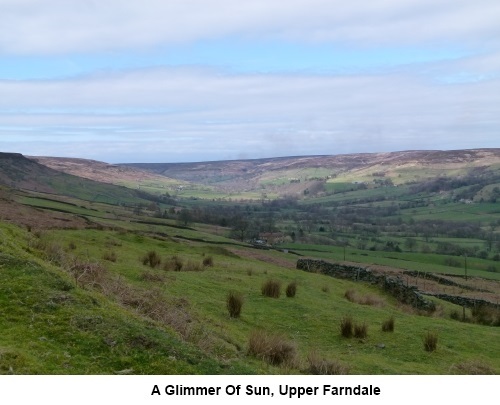 To get there, turn north off the A170 about a mile east of Kirkbymoorside on to a quiet lane signposted for Fadmoor. At the ‘T’ junction in Fadmoor, turn left for Bransdale. From here, follow the road for 2½ miles. 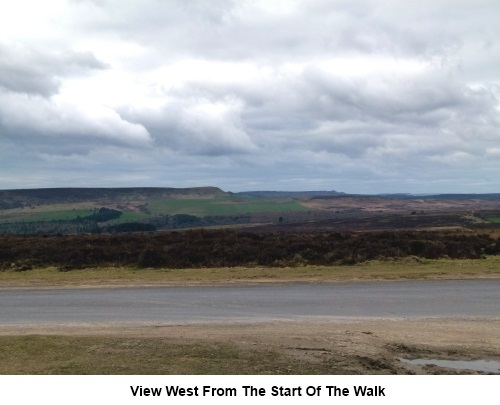 As you approach a sharp left hand bend, you can see the broad track across Rudland Rigg and the start of the walk stretching ahead of you, together with a North York Moors information board. The parking area is on the right. Start: Leave the parking area (SE 660927), turning right to follow the Rudland Rigg track. Quickly pass a sign which advises that you are entering the Nawton Tower Estate. Half a mile from the start of the walk, turn right along another broad, obvious track (SE 657935). After a further half mile, turn left on yet another broad track (SE 665937). There was a stand of three trees at the turn. Follow this track until it ceases after just under half a mile. This is the only tricky navigational part. 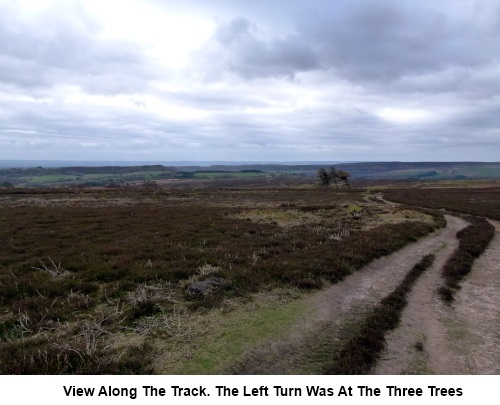 If you turn round and look to the left of the main track, you should be able to spot a thin path through the heather, virtually going back the way you came. You only head in this direction for seventy or eighty yards before joining another narrow path where you turn left (SE 667943). There is a marker post here. Soon passing a disused quarry (SE 668944), follow this path and when it forks, turn right heading downhill. At a five bar gate, turn right through the trees. Follow the obvious path downhill to the road and cross straight over it, to follow a narrow footpath to the left of a building. Follow this path down to the road (Mill Lane) and turn left to follow it through the hamlet of Low Mill, ignoring the road off to the right. 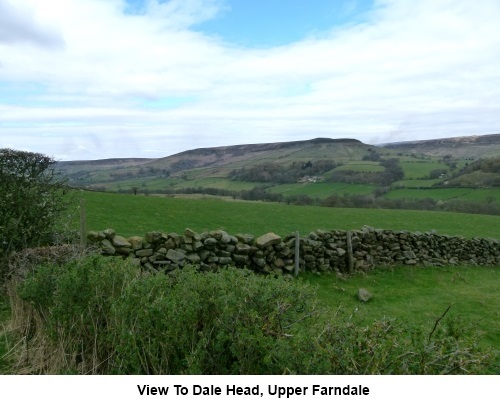 After the last building on the right, turn right through a gate into the Farndale Nature Reserve, following a public path fingerpost for High Mill. A very well manicured path now takes you through the daffodil (in season) area of Farndale, following the course of the River Dove, to High Mill. Here, pass between the buildings and turn left through a gate with a yellow footpath arrow. Cross the river via the footbridge. You should soon see a fingerpost. Bear right at about 45° to the river, following the finger for Cow Bank. The path climbs quite steeply to a road, where there is a superbly positioned seat for a picnic lunch. 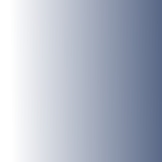 The route continues by turning right along it (based on your approach. 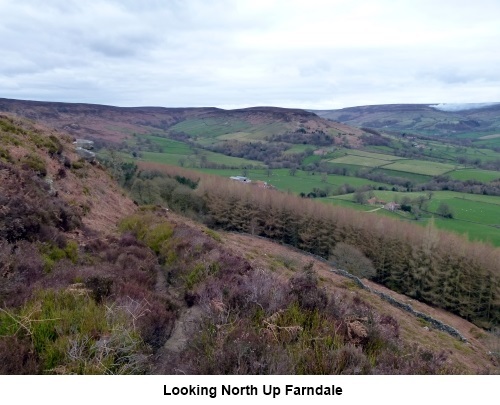 At the junction, turn left along the ‘dead end’ for about 250 yards, where you turn left up a broad but steeply climbing track, indicated by a fingerpost for “Bransdale”. Follow this track until you reach a crossroads of broad tracks (SE 641975), where the terrain has levelled out. Turn left and walk along this track for about three and a quarter miles back to the parking spot. At SE 650555, you pass the trig. point.